Toride was a quiet rural village until it was developed in the 1960’s as a bedroom suburb of Tokyo. People who worked in the capital started to move to Toride for its rich nature and good access to the center of Tokyo. Starting in 1995, the city began to lose inhabitants due to an aging population as well as the trend for young people to move back to the Tokyo city center. A group of local people got together to revitalize Toride. Places for people to come together were built; such as the old-fashioned candy store “Yoiko (good kid)” and the community art gallery “Emaru”. 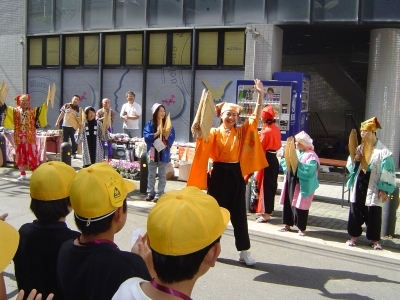 Since a campus of Tokyo University of Arts is located in the city, there have been many events arranged to connect young students and local people. Those people who stood up for the city include Ms. Kudo from Yoiko and Mr. Sobajima, who stayed in the city after studying art to keep doing more projects. We were fortunate to collaborate with them during our visit. Mr. Sobajima, together with other members of the local organizing committee, set up an event called “World Street”. A day prior to the event, each participant drew 3 small flags; the national flag of their native country, one with how to say ‘thank you’ in their mother tongue, and one with something famous from the place where they’re from, to be used in a game with local elementary school children. For the international event, 60 kids came to get involved and learn about different cultures. Children in Toride don’t have the opportunity to communicate with foreign visitors so often and so they were a bit hesitant to talk to us in the beginning, but after spending some time, connected really well. Passer-bys stopped for a while to take a look at what they were doing, and the otherwise lonely street was livened up once again. Some of the participants also leaned “Tamasudare (traditional bamboo stick performance)” at “Hohoemi San”. We teamed up with special needs “Tamasudare” performers who incidentally have became so popular in the region, that they visit elderly homes and schools on a regular basis. We enjoyed the opportunity to perform together, fully dressed in Japanese street-performer costume!